It’s barely May, but it’s already turning out to be a very good year for North American railroads. 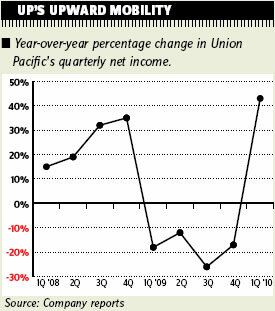 And now, the biggest just got bigger, as Union Pacific Railroad’s first quarter profit rocketed up 43 percent from a year earlier to $516 million on a 16 percent jump in revenue to $3.8 billion. UP’s net income was 13.7 percent of revenue, up from a profit margin of 11.2 percent in 2009’s first quarter, when traffic was falling rapidly amid the economic and trade downturn. Others in the Class I group of largest railroads also are warming up the tracks in 2010. Profit grew 20.5 percent in the quarter for Canadian National Railway, to $510 million, on a 5.7 percent revenue gain to $2 billion. That put CN’s net income at 26 percent of receipts in the period, up from 22.8 percent a year earlier. CSX Transportation earlier said its profit grew 24 percent to $306 million, while sales increased 11 percent to $2.5 billion. That was a 12.3 percent margin, up from 10.9 percent. All the railroads now expect solid economic growth this year, and strong rail activity as a result of increasing domestic and international trade volume. UP is especially well-placed to raise rates. It reported “core pricing” gains in the first three months of 3.5 percent, and laid out key reasons why its average rates will swell as the year progresses. Jack Koraleski, executive vice president for marketing and sales, said UP’s intermodal pricing was negative over the past year because of the recession and because it held a low-priced, long-term contract with shipment consolidator Pacer International. But UP and Pacer renegotiated their contract last fall, and the new terms allow higher rates on domestic loads. “This will be the last quarter that we have negative pricing in our intermodal franchise,” Koraleski said. Finally, he said a lot of UP’s non-contract or tariff business “is still reflective of last year’s softer economic terms,” but some of that is already updating. “As we start to see truck capacity tighten and truck pricing going up, those kinds of things, we’re back at the table looking for opportunity” to firm up rail pricing for truck-competitive tariff loads. Freight shippers are still getting a break on some third-party railcar costs, however. Equipment leasing firm GATX said its lease price index shrank 15.2 percent in the first quarter, a bit slower than in the fourth quarter but nearly triple the decline of a year earlier.